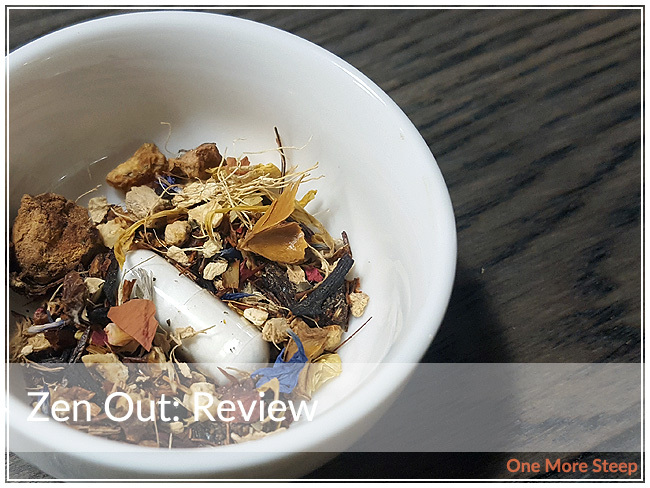 Kailo Tea has provided me with Zen Out for the purposes of providing an honest review. The second of the teas sent to me by Kailo Tea (the first was Wake Up, which I reviewed earlier this month). This time it’s an herbal infusion with added vitamins so yes, there was another capsule in my tea. 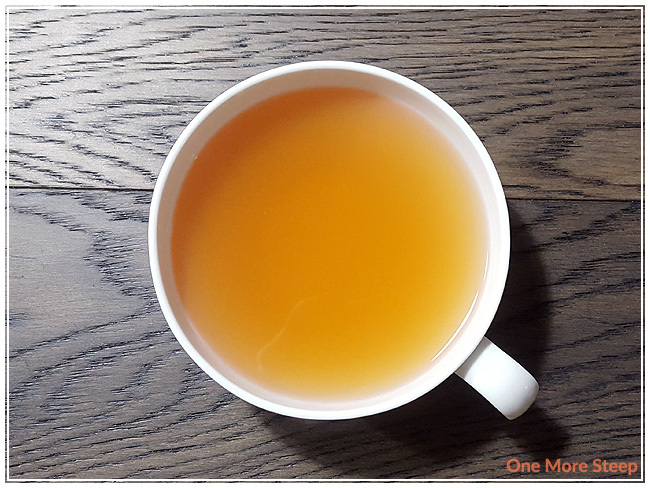 This herbal infusion has a great mix of ingredients that smell delightful – I mostly make out the smell of citrus (from the orange and lemon) and the ginger. It smells like a great night time herbal infusion to have since it lacks caffeine. 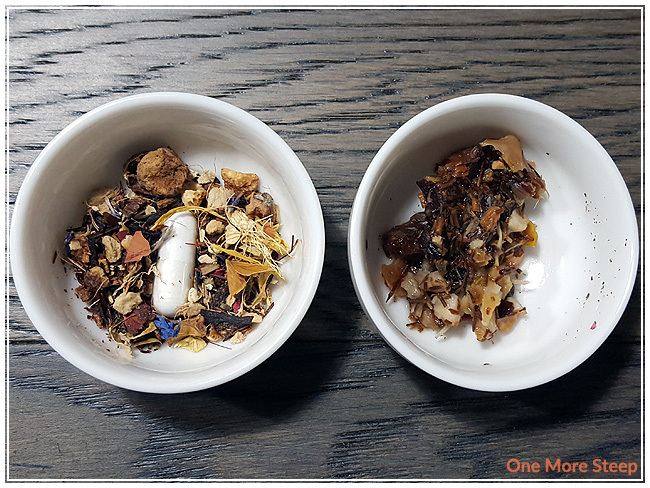 Zen Out consists of: rooibos, currants, orange peel, cornflowers, acai, lemon peel, hibiscus, apple, rosehips, strawberry leaf, linden leaf, calendula, rose, natural and artificial flavours, ginger root, vitamin D3, vitamin 3, and magnesium citrate. The packaging mentions lavender and it’s missing from the ingredients list. Kailo Tea recommends steeping Zen Out in 200-210°F (93-99°C) for 5 to 6 minutes. I steeped Zen Out initially for 5 minutes. Zen Out steeps to a dark orange, and it slightly cloudy (like it’s Wake Up counterpart, I attribute that to the vitamin capsule). It smells mostly of ginger and citrus. I’m a bit surprised that it’s not more pink because of the hibiscus, which I find always turns everything a deep shade of pink. The rooibos base in this tea does give it that usual medicinal smell. On first taste, I primarily tasted the ginger. Pleasantly, the rooibos base wasn’t overpowering the rest of the ingredients. I typically don’t like rooibos, but the ginger and citrus flavours are strong and pretty much rule over everything else. It doesn’t taste too sweet, although I wish I could make out the rest of the ingredients. I attempted to resteep Zen Out and found that the flavour to be lacking as it was quite watery. I think Zen Out is best for just one steep. 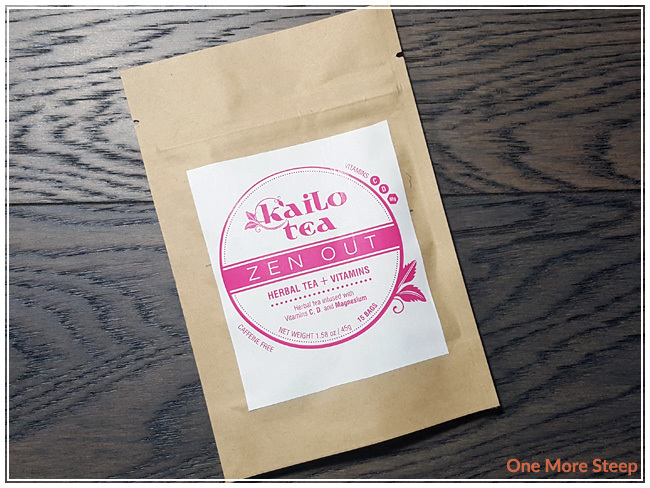 I liked Kailo Tea’s Zen Out. 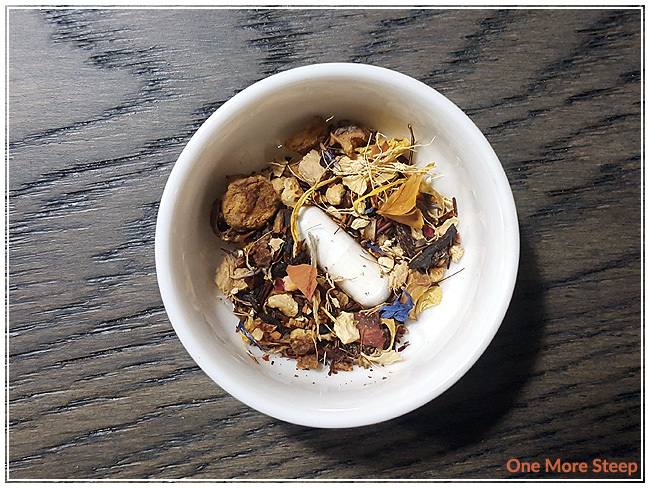 I’m not typically one for rooibos, but I found that the other ingredients in this blend overpowered the medicinal flavour that I don’t like from the rooibos which was a major plus for me. The ginger and citrus flavours are delicious, bright, and yet relaxing. I don’t think it makes me sleepy though, but doesn’t make me feel overly energetic so perhaps it managed to do what its meant to do.